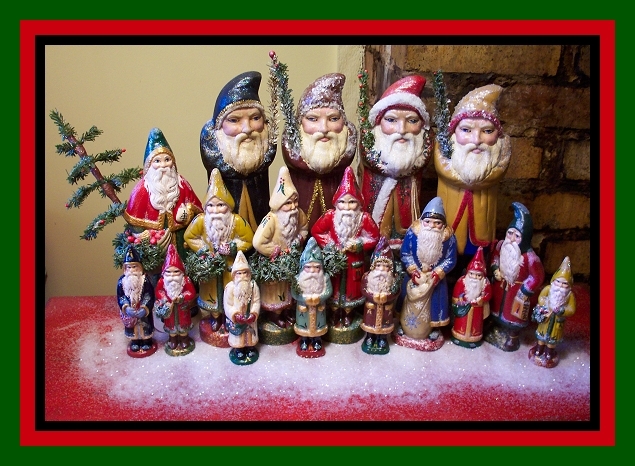 The 1840 Stone House offers a wide selection of finely hand painted CHALKWARE SANTA, BELSNICKLE, FATHER CHRISTMAS, PERE NOEL and SNOWMEN collectibles and SPECIAL GATHERINGS. Each collectible is fashioned using antique chocolate molds, painted and designed by artist Deanie Jaco-Green bringing you a fine art quality heirloom for generations to come. Your antiqued 3 dimensional piece of Folk Art is SIGNED, DATED, AND NUMBERED and will arrive in their own gift/storage bag with an aged name tag. These are some of my favorite things for the holiday and everyday. Remember....Collectible chalkware is available ALL YEAR LONG! Just simply the perfect gift any time of the year.....making memories again and again! Can't decide on that special gift? GIFT CERTIFICATES are available, ready to be sent to the lucky recipient. * Order online using the online shopping cart, accepting all major credit cards. *Give The Stone House a call at 608-574-0086 and place your order by phone, accepting all major credit cards. *Mail your order, address below.